Christina Crawford (Diana Scarwid and Mara Hobel) tells about growing up with her abusive adoptive mother, Joan Crawford (Faye Dunaway). Peary’s response to this cinematic adaptation of Christina Crawford’s best-selling autobiography is similar to that of most critics at the time (Roger Ebert, for instance, gave it one star out of four; see link below). Peary calls it “ludicrous”, “mediocre”, and “trivial”, and lambastes it for both fabricating “nearly every event that takes place,” and eliminating “real people” in place of composites. He complains that Dunaway is simply playing “the Crawford who is [already] familiar to viewers — the Crawford of the movies, newsreels, and personal appearances”, rather than “the Crawford of Christina’s book”, simply so that the “sheepish” filmmakers could try to “dodge negative backlash” from her fans. I’ll admit that my initial response to Mommie Dearest was the same as Peary’s. I watched it immediately after reading Crawford’s book, and was upset by how egregiously the filmmakers had mangled Christina’s story of her abusive childhood. 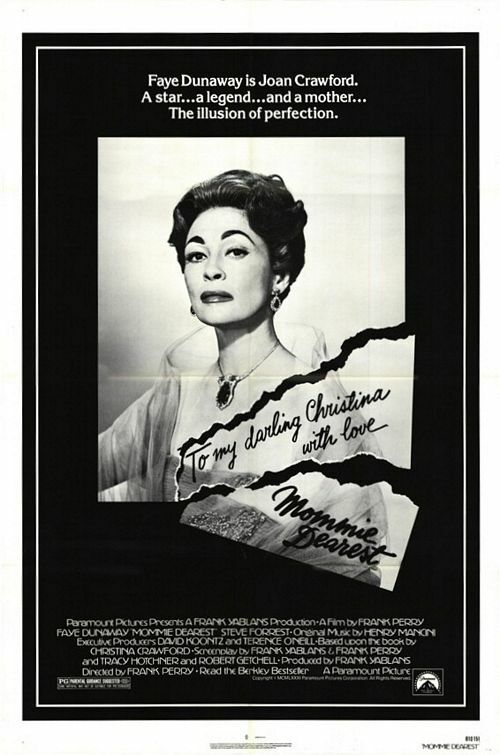 Watching it again years later, however, I can appreciate Mommie Dearest for what it unintentionally turned out to be: a film so clumsily made — and so far removed from its source material — that it’s actually entertaining. Indeed, it is precisely the film’s “staggeringly bad scenes and campy dialogue” which have contributed to its cult over the years, allowing those who “laugh at its overall ineptitude” (click here for a long list of goofs) to have a grand old time. Plus, despite its obvious flaws, the film contains many moments of genuine insight into Crawford’s character. When Dunaway holds her infant daughter in her arms for the first time, and is reminded by her boyfriend (Steve Forrest) that Christina is both a “very lucky” and a “very expensive” baby, we are reminded that Crawford ultimately bought her children rather than adopted them. When Dunaway reacts with thinly-veiled jealousy as reporters seem more interested in filming her daughter than her during Christina’s birthday party, we really “get” how difficult it was for Crawford to share the limelight, even with her own kids. And when Dunaway expresses her heartfelt gratitude to the crowd of fans standing outside her house after she won an Oscar for her performance in Mildred Pierce (1945), we learn why her following was so enormous — and so loyal — for so many years. Most impressive of all, however, is the powerhouse performance by Faye Dunaway, who, though “she overacts at times,” makes “a gallant effort playing Crawford not as a villain, but as a ‘warrior’.” Indeed, it’s absolutely fascinating to gain an inside glimpse at this rags-to-riches actress, someone who took her status as a beloved Hollywood star so seriously that she was willing to work as hard as it took to maintain it. Though Peary argues that “Dunaway’s Crawford comes across as no less sympathetic” than her daughter, I disagree: when watching Crawford obsessively scrubbing her own floor, jogging to stay in shape, and getting up at the crack of dawn to arrive at the studio on time, we understand that this was a driven woman who, quite simply, didn’t have a clue about how to be an effective mother. Yes. This notoriously “bad” movie has become a true camp classic, and should be seen at least once by every film fanatic. Discussed at length in Peary’s Cult Movies 2 (1983). Oh my, yes, a must – a rare distinction for such a guilty pleasure. It’s also a rare example of a film that just about defies critical analysis. It just can’t be taken that seriously – but it was, in some sense, taken seriously by critics because it exposed a Hollywood icon. (And its particular angle on child abuse was considered groundbreaking in its day.) Of course, one doesn’t really know who/what to believe in terms of how/why it got made. Many say the adopted Christina is a vengeful liar; many say not. Many say the rumors about Crawford were exaggerated, many say not. We can only go by what we know for sure. For example, if you look at the filmography of Frank Perry, ‘Mommie Dearest’ fits perfectly with his interest in dysfunctional characters. (Naturally, he could only go with what his writers gave him; and they seem to have largely opted for a compilation of ‘greatest hits’ moments from Joan movies.) We also know that it’s very telling that Joan took over for her daughter in ‘The Secret Storm’ somewhere in between the time she filmed ‘Berserk’ and ‘Trog’ — you do the math, but such an action speaks beyond ‘visibility at all cost’; it reflects an unrealistic and inflated (to say the least) ego…which lends a certain credibility to ‘Mommie Dearest’. Yes, there is a genuine attempt to illuminate Crawford’s behavior (“Ma changed husbands faster than she changed bedsheets.”; discovering she had seven miscarriages; as well, her big scene with L.B. Mayer seems spot-on – as does her confession to Christina about being broke) – but a serious exploration of her character is specious. What we get most of the time is very unintentionally hilarious: note Crawford’s face – and Christina’s look of triumph – when a photographer tells her, “Actually, Miss Crawford, [the grass stain] might read.”; note during the what-seems-Kabuki-influenced ‘night raid’ scene when, in spite of herself, Crawford segues from the anger of “We’re going to see how many wire hangers you’ve got in your closet.” to an involuntary, bend-in-half laugh; how can one resist guffawing when Crawford asks the school headmistress, “Is this an institution of learning or a teenage brothel? !”; and, of course, the scene in which Crawford lunges for and chokes Christina is performed as the most ill-advised Greek drama (even if it’s true!). I think it’s unfair to see the film as a kind of ‘Rocky Horror Picture Show’ – where people dress up as Joan and pile on the ridicule. Whatever the truth behind ‘MD’, something was seriously wrong in that household. Could a quality film have been made from that material? Possibly. But what we’ve been given is a thing apart – regardless of whose life it’s based on. It’s that verrry strange mixture that just keeps giving as jaw-dropping cinema at its best.